Published in the Journal of The Classical Chinese Furniture Society, Winter 1991, p. 17, in Dr. Sarah Handler’s monograph on Luohan beds – “Comfort and Joy: A Couch Bed for Day and Night.” Compare with a zitan wood round legged Luohan bed in Wang Shixiang’s Classic Chinese Furniture, 1986, pl. 122, p. 183, which has plain ornamental struts and a single waist molding surrounding the platform frame. In our exhibit, the solid back panel of huanghauli wood and dual waist moldings, combined with double circle motifs, give this bed a perfectly proportioned and restrained elegance. 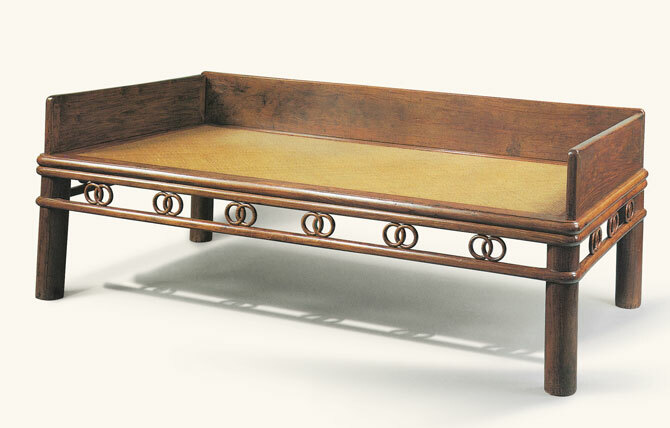 The construction and form of this Couchbed with Round Legs is discussed in further detail on pages 93 to 96 in Dr. Sarah Handler’s Ming Furniture In The Light of Chinese Architecture: “The couchbed was especially popular for use in the scholar’s studio where it was convenient for sleeping, reclining, and sitting with books and scrolls spread about. The studio was a man’s private space, a symbol of his success, and a sign of his cultivation. It was where he studied, wrote, painted, played musical instruments, and informally entertained friends….